FAO has conducted numerous initiatives in Africa during the past ten years to control aquatic weeds. Projects have been conducted at regional and national level. FAO convened an international expert consultation on Strategies for Water Hyacinth Control, in Fort Lauderdale, Florida, USA, in September 1995. The consultation had two main objectives. The first objective was to prepare suitable guidelines for Water Hyacinth control in developing countries of the tropical and sub-tropical regions, indicating the strategy for the implementation of the methods available. The second objective was to prepare an updated status report of biological control of Water Hyacinth, including the natural enemies and the methods for rearing and release, and give advice for its rapid and successful implementation in developing countries. Prominent specialists attended the consultation and discussed specific problems and solutions for African countries. The experts provided up-to-date information and prepared a strategy for integrated Water Hyacinth control. East African countries share an extensive and interconnected system of freshwater lakes, rivers and lagoons heavily utilized for navigation, fishing, irrigation and power generation. The interference of aquatic weeds with these waterways constitutes a particularly difficult problem because of their capacity for regeneration and spread and because of the diverse and adverse effects on aquatic ecosystems. The main aquatic weed in East Africa is Water Hyacinth. The work conducted by FAO also included technical consultancies and provision of biological control agents (insects) through the Commonwealth Agricultural Bureaux International (CABI). A regional project was conducted between 1993 and 1994 in Kenya, Rwanda, Tanzania and Uganda. During this project (a) a five-year project document was formulated to establish a technically sound system to control aquatic weeds in East Africa; (b) national policies were developed in Water Hyacinth control; (c) a biological control programme was started against Water Hyacinth in the subregion; (d) a regional training course was held on the control of aquatic weeds; (e) host specificity studies were carried out on Neochetina spp. (Coleoptera: Curculionidae) in Uganda and Kenya; and (f) a regional technical consensus was developed on the biological control of Water Hyacinth in Lake Victoria. This regional project provided the basis for the implementation of biological control in the region and was followed by the system established in the project document - one of the outputs of this project - which was subsequently funded by the World Bank and is currently in progress. In 1991 the Government of Uganda and FAO launched a short-term project under the Technical Cooperation Programme of the FAO to assess the extent of Water Hyacinth infestation in the Uganda sector of Lake Victoria and in Lake Kyoga. This project strongly recommended initiating immediate control measures with biological control agents - e.g. the weevils N. eichhorniae and N. bruchi - in combination with short-term control measures. The regional project mentioned above then followed during 1993 and 1994 in Kenya, Rwanda, Tanzania and Uganda. A short project under the Technical Cooperation Programme of FAO was also conducted during 1996 - 1997 in Uganda. 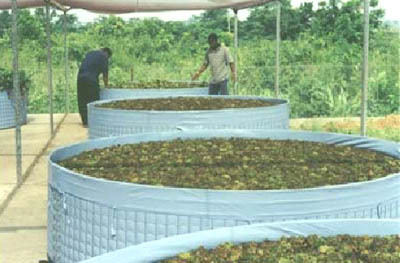 This project allowed (a) the construction of rearing units and the provision of training in biological control techniques; (b) the training of 18 District Fisheries Officers on matters related to the use of integrated control of Water Hyacinth, for further sensitization of local communities at affected fish-landing sites; and (d) the creation of working teams trained to remove Water Hyacinth as planned by the community Water Hyacinth management groups. To date, over 60 per cent of the Water Hyacinth in Lake Victoria has been destroyed by biological control agents. 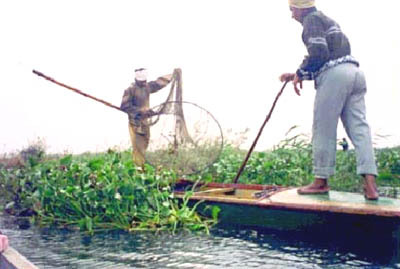 Floating aquatic weeds such as Water Hyacinth, Water Lettuce and Water Fern are a hazard to water bodies in West Africa, where they invaded inland waters of various countries in the early 1980s. The high level of infestation of the Niger River by aquatic weeds has become a problem, especially with regard to its effects on navigation, irrigation in paddy fields, water flow in irrigation canals, fishing, human health and - particularly in Mali - hydroelectric power stations. The worst infestations in Mali are those of Water Hyacinth in the districts of Loulikoro and Bamako and Water Lettuce in Koulikoro, Bamako, Ségou and Mopti. 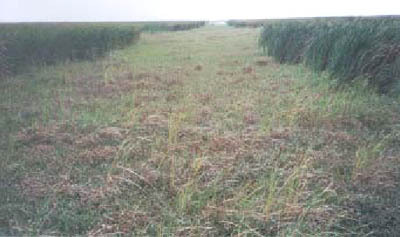 A project for the management of waterweeds was carried out in Mali in the period 1996 - 1997. 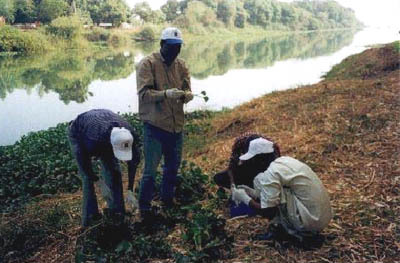 During this project (a) training on the control of aquatic weeds was conducted; (b) the levels of infestation of floating aquatic weeds on the Niger River were assessed and an inventory of species was prepared; (c) a biological control programme for Water Hyacinth and Water Lettuce was started; (d) a strategy for integrated pest management was defined; and (e) a rearing facility for biological control agents was established. This project was followed by the regional project mentioned below, involving Benin, Mali, Niger and Nigeria, which was started in October, 2000. A regional project involving Benin, Mali, Niger and Nigeria, was started in October, 2000, for (a) providing training in methods of floating weed surveillance and in the rearing of the weevils Neochetina spp. and other natural enemies of Water Hyacinth; (b) the introduction of biological control agents in the country and the establishment of units for their rearing; (c) the creation of a database on the levels of infestation of aquatic weeds in the basin of Niger River and on the establishment, population levels and impact of the natural enemies released; (d) the organization of a network for cooperation on the control of Water Hyacinth in the countries affected; and (e) the formulation of a draft long-term project for further submission to donors. A subregional training course on aquatic weed control for Niger basin took place and the other activities are in progress. A project funded by the European Commission was implemented by FAO, with consultancies by the Commonwealth Scientific and Industrial Research Organisation (CSIRO), during the period 1994 - 1996 for the integrated control of aquatic weeds in Ghana. In particular, the objectives of this project were to (a) assess the aquatic weed problem; (b) strengthen national capabilities for aquatic weed management; (c) strengthen international collaboration; and (d) prepare a subregional project for the member countries of the Economic Community of West African States (ECOWAS) on integrated control of aquatic weeds. The project carried out surveys of some 36 water bodies (reservoirs, lagoons, rivers and lakes) countrywide, assessing the major weed species and their cover. In the course of the survey some species, new as weeds, were recorded, namely Limnocharis flava (Butonaceae) and Vallisneria gigantea (Hydrocharitaceae). Extensive countrywide public education using warning posters, video documentaries, print and electronic media and public fora was carried out as well. Also, the project successfully introduced and allowed for the establishment of three biological control agents for Water Hyacinth and a biological control agent each for Water Lettuce and Water Fern. Manual and chemical control (using Glyphosate) was carried out with varying degrees of success and cost. The experience gained with this project has benefited not only weed workers in Ghana, but also those in Côte d'Ivoire, Burkina Faso, Mali and Senegal. Following this project, the regional project mentioned below was started in June, 2000, in Burkina Faso, Ghana and Togo (in progress). A regional project was started in June, 2000, in the Volta basin, involving Burkina Faso, Ghana and Togo. In these countries aquatic weeds are a menace to fisheries, aquaculture, navigation, drainage, irrigation, water supply schemes and power generating schemes. The objective of this project, which followed a project of the European Commission on the integrated control of aquatic weeds in Ghana, is to assist the governments of these countries in preventing further spread of aquatic weeds and to coordinate aquatic weed management. In particular, training was carried out and activities are being conducted to (a) establish surveillance systems of aquatic weeds in these countries; (b) introduce, rear and release biological control agents to use against Water Hyacinth, Water Lettuce and Water Fern; (c) establish a rearing unit in each country; (d) conduct awareness campaigns on aquatic weed problems and methods for their control among the rural population, involving rural communities in the release of selected biological control agents; (e) establish national committees on aquatic weed control; and (f) establish inter-country cooperation and exchange of information on matters related to aquatic weed control. A regional training course on the management of aquatic weeds was held and the other activities are in progress. Since the early 1980s the water bodies of Côte d'Ivoire have been invaded by several species of aquatic weeds, including Water Hyacinth, Water Lettuce, Water Fern, Nymphea (four species), Lotus (Nelumbo nucifera), Polygonum (five species), Leersia and others. The first three among the above-mentioned species were definitely the most noxious. A Project funded by the United Nations Development Programme (UNDP) was conducted during the period 1994 - 1999, addressing specifically (a) the control of Water Hyacinth, Water Lettuce and Water Fern using natural enemies; (b) the monitoring of population dynamics of target plants and biocontrol agents; (c) the study of biodiversity in water bodies; (d) the strengthening of national capacities in term of integrated pest management and coordination with projects in other countries; and (e) the dissemination of the results in other countries having similar problems. During this project weed specialists were trained and four biological control agents were successfully imported, reared and released (the weevils Neochetina bruchi and N. eichhorniae against Water Hyacinth; the weevil Neohydronomus affinis against Water Lettuce; and the weevil Cyrtobagus salviniae against Water Fern). All of them established. Attempts to rear the moth Niphograpta (Sameodes) albiguttalis against Water Hyacinth failed. Some control of Water Hyacinth was obtained, but given the severe infestation, additional means of control would be desirable to achieve control in the short-term. Good control of Water Lettuce was obtained. This project was conducted with the collaboration of the CSIRO, providing consultancies and of the International Institute of Tropical Agriculture (IITA), which provided biological control agents. 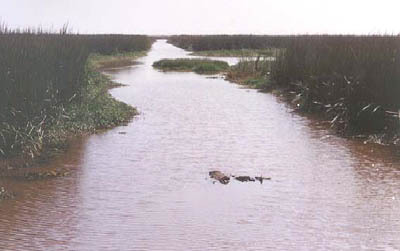 Water Fern was officially recorded in the Senegal River in September, 1999, near the villages Khor and Rosso, about 60 km from the Diama dam. This plant was originally introduced for cultivation in Khor for its use in integrating poultry feed. Unfortunately floods allowed the plant to escape cultivation and invade both sides of the Senegal River for a distance of about 70 km. Water Fern then also invaded the canals in the region and the Lampsar and Gorom Rivers. In 2000, Water Fern and Tipha australis were estimated to infest altogether an area of 18,694 ha, 10,854 ha of which were on the Senegalese side and 7,840 ha on the Mauritanian side. A regional project was started in February 2001 in Mauritania and Senegal to (a) build two units for the rearing of the weevil Cyrtobagous salviniae (one unit in each country); (b) release the weevil in the field; and (c) establish a surveillance system for the fern and the weevil. To date the following tasks have been accomplished: (a) The weevil has been introduced, the rearing is in place and the weevil has been released; (b) Cyrtobagous salviniae has been established at the release sites, where it is effectively controlling the weed; local authorities and rural communities (about 26 000 people in 23 villages in the area invaded) have been sensitized about the importance to control aquatic weeds. Following the excellent results of biological control, parts of the Senegal River, where previously dense mats of Water Fern occurred, have been completely cleared. The project is still in progress.